Each and everyday, each one of us has a chance to make the world a better place. We have to make choices in our daily lives that will either hurt or help the world around us. Are we going to be part of a solution or part of the problem? Everyday people have the opportunity to be a hero. Whether its choosing to not pollute the roads and water ways by tossing cigarette butts out of their car window, or choosing not to use toxic chemicals in their yards, or choosing to work for an hour or two every other Saturday helping feed people at a soup kitchen, people have many chances each day to make a difference. Those things all add up and everything we do counts. The amphibians of the earth now face mass extinction. Some of the reason is linked to a fungus but another big part of the problem is the use of pesticides, lawn chemicals and weed killers, as well as pollution, acid rain, radiation from nuclear disasters like bombs and Chernoble, and the destruction of natural habitats thanks to massive surburan sprawling. From this perspective it is easy to see how the actions of humans destroy the planet, so choosing to NOT do something to add to the problem is really a big deal, like bringing your own cloth bags to a supermarket and not using paper or plastic bags as a happy result. You can choose to learn organic gardening at home and it will make a difference. Even people who do garden organically can be effected by neighbors who don't. Rain and sprinkler run off can come into an otherwise organically managed garden and yard, but at least your organic garden is not contributing to the problem. These are little things everyone can do and they do make a huge difference, but the list of good things you can do is endless. 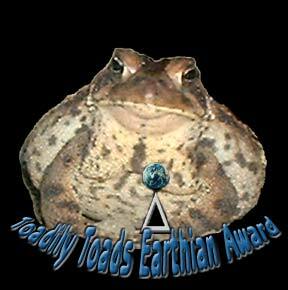 Toadily Toads would like to honor some special people who are doing what they can for others and the Earth. If you know of somebody, come to the Toadily Toads forum and let us know. Maybe that person will be in this special section someday. Click here to meet our first Toadily Toads Earthian Award recipient, Rolf Helbig and learn about his wonderful hand crafted, very functional toad and wildlife houses. Click here to meet a famous celebrity who few know much about. A real humanitarian who serves as an inspiration to others of how one man can make a difference in the lives of other people.